The Phâro 24 Carat Rose Gold Infused Skin Care is the latest innovation in the beauty industry. The power of precious minerals has a tremendous influence on the skin cells when combined with Phâro Facial Massage it provides the client a rejuvenating treatment working on the facial muscles and deep layers of the skin. 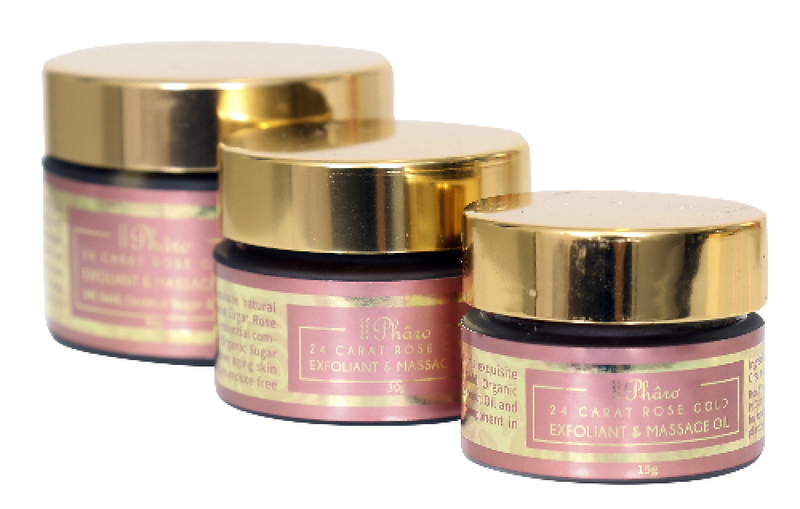 Phâro 24 Carat Gold Facial Treatment leaves the skin visibly rejuvenated and radiant. Phâro Infused Facial Serum is in-fused in a Rose Water base, 24 Carat Gold with Vitamin C, Cucumber hydrosol, Grapefruit Seed Extract, Sweet Almond Oil and Alpha Arbutin provide concentrated immediate and long-term stimulation for a radiant and healthy skin. The fast absorbing formula contains Vitamin C which can help repair blemishes and hyaluronic Acid for increasing subcutaneous Collagen synthesis. The Almond Oil containing Vitamin E and Cucumber nourish and cool deep into the skin even as the Rose Water soothes the outer dermal layers. Gently massaged into the skin, tired skin looks plumped and hydrated, and feels firmer, smoother and energized. Rose Water infusion with 24 Carat Gold, Vitamin C, Cucumber hydrosol, Grapefruit Seed Extract, Sweet Almond Oil and Alpha Arbutin provide concentrated, immediate and long-term hydration for a radiant, refreshed complexion. Phâro Exfoliant & Massage Oil will bring an effective element to the facial treatment by relaxing and energizing the clients facial area. The blend of Rose, Coconut and Jojoba Oils rejuvenate, moisturize and protect the skin, leaving it soft and smooth while the catalytic Gold particles reduce free radicals and create a luminous, radiant skin with a romantic rose fragrance. The benefit of adding Phâro Relaxation Massage to the treatment session is that the face will look and feel smoother and more toned as you increase the circulation and help to release muscle tension. The Organic Sugar will gently exfoliate, polish and remove aging skin cells while Alpha hydroxyls stimulate skin regeneration. If you want the Organic Coconut Sugar in smaller particles, heat it gently using an oil burner. Ensure the temperature is warm, but not hot, before applying it to the client’s skin. Some clients call it their ‘mini facelift’ by helping to strengthen layers of skin tissue and improve skin tone. Additionally, over a series of sessions there may be a reduction in lines and wrinkles, helping clients to feel good and look good! When applied to wet skin, this exquisite natural blend of 24 Carat Gold, Organic Coconut Sugar, Rose Oil, Coconut Oil and Jojoba Oil is an essential component in any skincare regime. Phâro Gold Floral Water utilizes the legendary catalytic powers of gold for healing and rejuvenation, and distillate of Rosa Damascena which has a vast range of therapeutic uses including moisturizing, enhancing skin tone and soothing sensitive skin. Rose Water promotes healthy and elastic skin and gently cleanses and tones all skin types, maintaining the pH balance, stimulating the regeneration processes and calming the skin. The perfect blend effective for all day skin hydration. Gold Floral Water by Phâro is created with the perfect combination of 24 Carat Gold and Rose Water and is perfect for all skin types. The boxed set contains 30 x 24 Carat Gold Leaves in three different sizes. 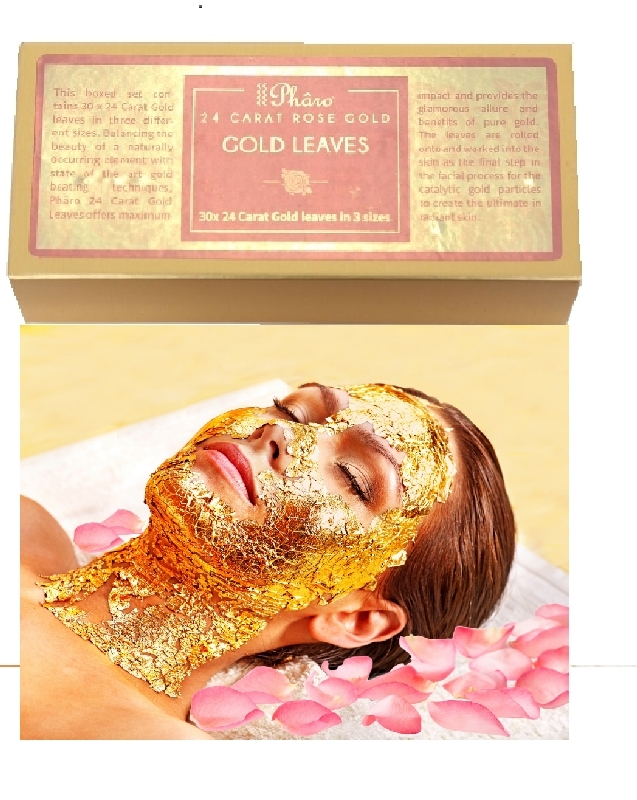 Phâro Gold Leaves offers maximum impact and provides the glamorous allure and benefits of pure gold. The leaves are rolled onto and worked into the skin as the final step in the facial process for the catalytic gold particles to create the ultimate in radiant skin. Gold is well reputed for restoring the lost elasticity properties of the tissues, slowing down Collagen depletion and the breakdown of Elastin to prevent sagging skin. It stimulates cellular growth of the deepest layer of the skin to regenerate healthy, firm skin cells and provide a tightening effect. The anti-inflammatory properties of gold are thought to decrease skin inflammation and seems to slow down Melanin secretion and reduce age spots. The skin looks rejuvenated and radiant. The Phâro Golden Pulse Facial Massager activates the skin and keeps the skin elastic through vibration (massage). 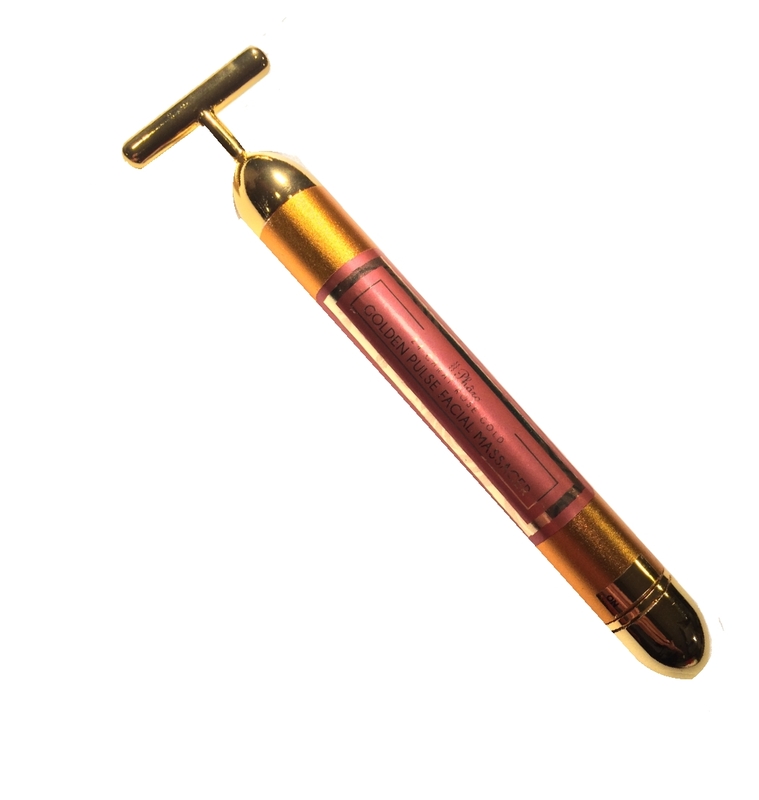 The T-shaped head adds a mild vibration to pulsate the face skin and it zones. The Phâro Golden Pulse Facial Massager has 6,000 rotations per minute while vibrating. Helps restore skin radiance, firmness and elasticity, and helps eliminate and smooth wrinkles and enriches the skin, promotes blood circulation and instantaneous activation of cell activity. 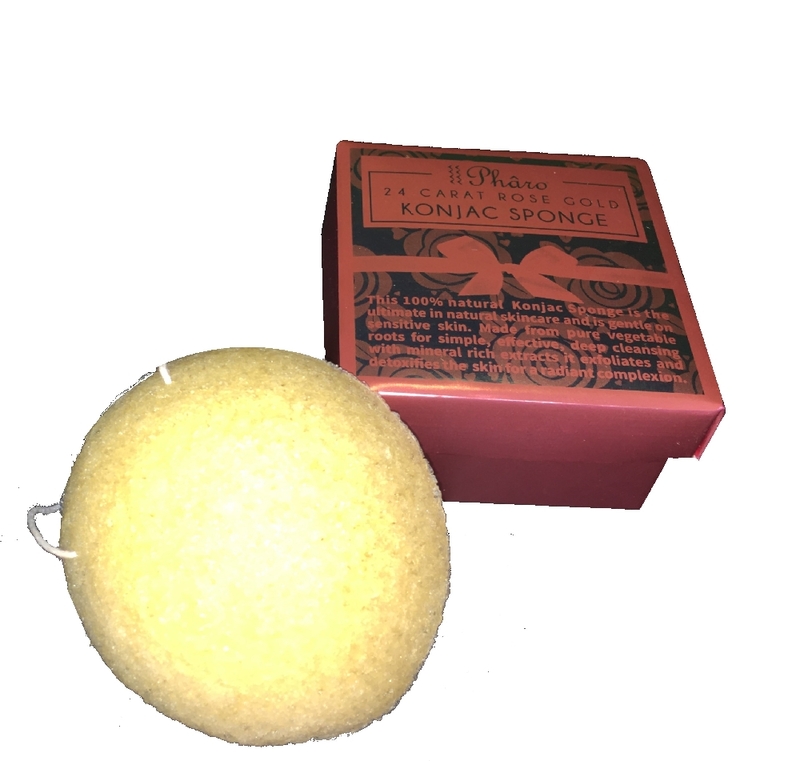 This 100% natural Konjac Sponge is the ultimate in natural skincare and is gentle on sensitive skin. Made from pure vegetable roots for simple, effective, deep cleansing with mineral rich extracts it exfoliates and detoxifies the skin for a polished and radiant complexion.